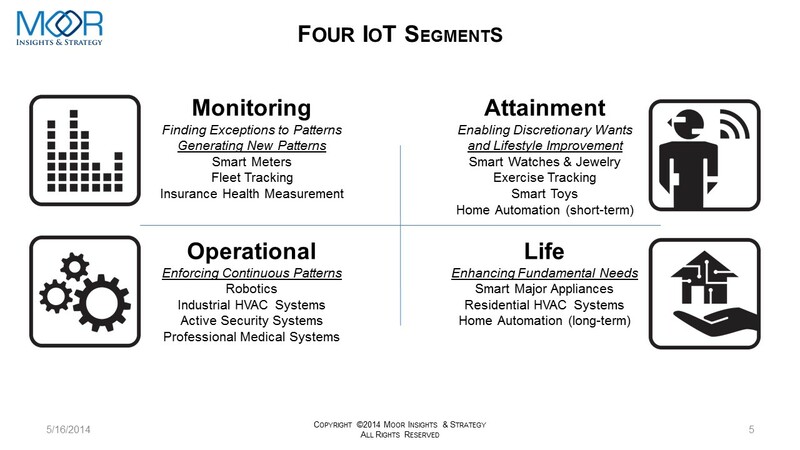 In this paper and presentation Patrick Moorhead and his colleagues describe how IoT can be segmented into four quadrants based on needs and input. The Input axis goes from self-directive and autonomous to interactive and reactive; the Needs axis goes from Survive to Thrive. The resulting axes are Monitoring, Operational, Life and Attainment. These fairly self-explanatory titles cover the differnt aspects and uses of IoT. Morhead also gives a good description on how Big Data and Analytics are essential to IoT. All in all, the paper is an excellent aid to take a systematic approach to IoT. Required reading for any company thinking of jumping on the Industrial Internet wagon.